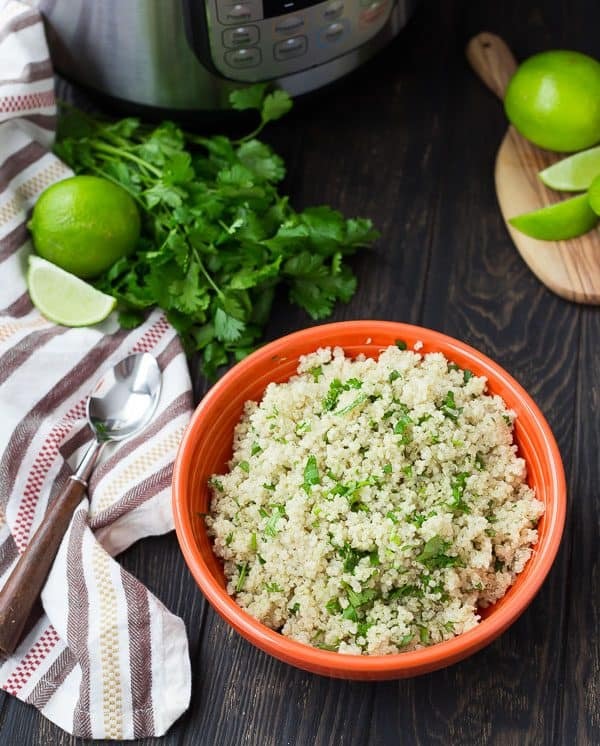 Instant Pot Quinoa is so quick and easy to make, plus it’s nearly hands-off! 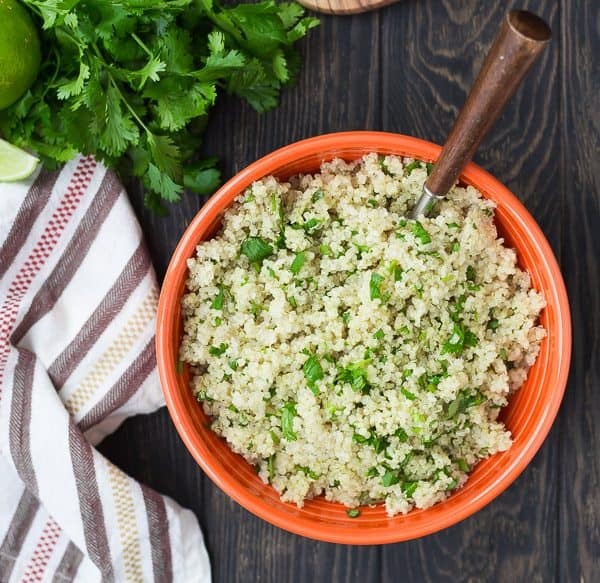 You will love this method of cooking quinoa if you’re a pressure cooker user. Try it today! 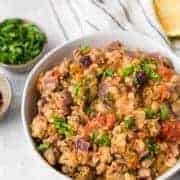 Am I getting predictable with these Instant Pot recipes? I just love that thing, I can’t help myself! If you guys haven’t done quinoa in it, now is the time! 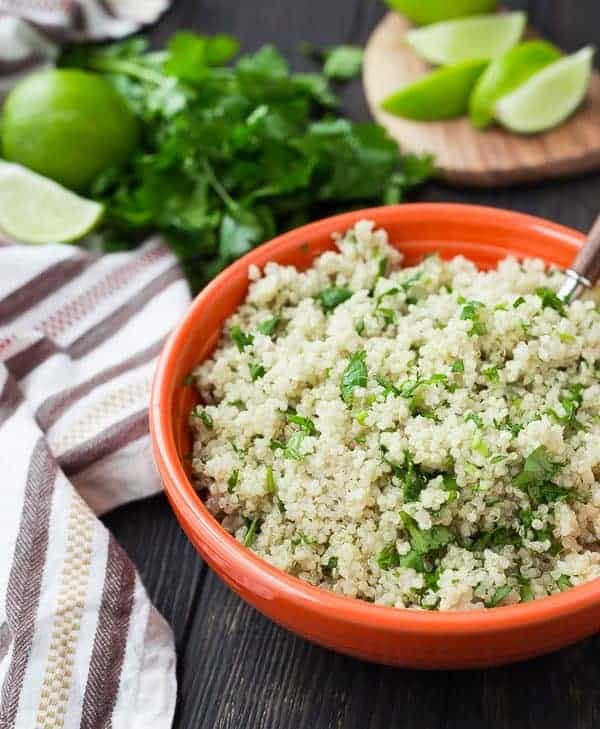 This cilantro lime quinoa is absolutely perfect as a side dish for any Mexican recipe, and it makes the best base for burrito bowls. 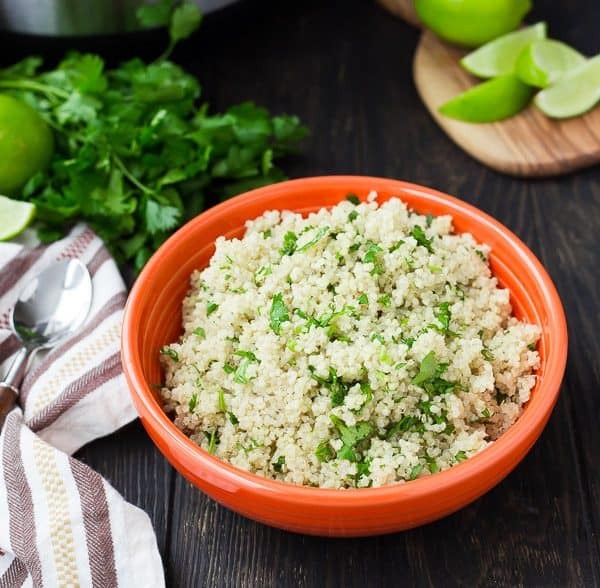 Quinoa is full of protein and is naturally gluten-free. 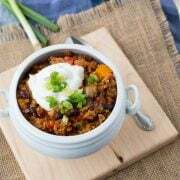 Making Instant Pot quinoa is also a great way to have quinoa on hand for quinoa pancakes, quinoa muffins, quinoa salads, quinoa bowls, and more. It’s such a great building block of so many recipes! And the Instant Pot makes it perfectly! You’re going to love this, whether you make it plain or dress it up with cilantro and lime (my fave!). PS: Michigan finally embraced the concept of spring! We’ve enjoyed so much time outside this weekend and I hope it never ever goes away! Is it warming up where you live? It’s so easy! 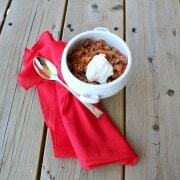 Here are the simplified steps, but as always, scroll down for the complete printable recipe. 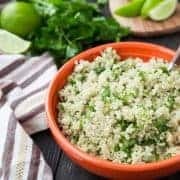 Place quinoa in the Instant Pot insert and add salt, water, and 1/2 teaspoon oil (I like avocado or olive oil). Turn valve to seal and set the pressure cooker for for one minute on high pressure (use the “manual” setting). When the timer goes off, let the pressure release naturally for 10-15 minutes or until the valve drops. Fluff with a fork, season as desired, and serve! How long do I cook quinoa in an Instant Pot? Only one minute! Of course, if you’ve used the Instant Pot before, you know there’s a little more to the story than that. It does take some time for the Instant Pot to come up to pressure and with this recipe, you’re also going to let it naturally release which takes 10-15 minutes. How much does 1 cup of dry quinoa make? About three cups of cooked quinoa! Different brands of quinoa have different recommendations, but I recommend giving it a quick rinse in a fine mesh strainer. In the Instant Pot, rinsing the quinoa before cooking also cuts down on the chance of it foaming up too much. What is the quinoa to water ratio for cooking quinoa? In the Instant Pot, use 1 1/2 cups of liquid per every cup of dry quinoa. PS: Don’t forget the guacamole on your burrito bowls! In the Instant Pot or other pressure cooker, combine quinoa, salt, water, and oil. Secure Instant Pot lid and turn valve to seal. Set pressure cooker to manual for 1 minute on high. When it has finished cooking let the pressure release naturally (in other words, leave it alone) until the valve lowers, about 10-15 minutes. Remove cover and stir in lime and cilantro, if desired. Verdict: I love this cilantro lime quinoa, it’s one of my favorite burrito bowl building blocks. Add some Instant Pot shredded chicken, roasted sweet potatoes, pickled red onions, restaurant style salsa, or whatever your heart desires! Other great choices are sheet pan fajitas or this mango avocado salsa with pineapple. Husband’s take: I think most times he prefers cilantro lime rice to quinoa, but he had no complaints about this quinoa! 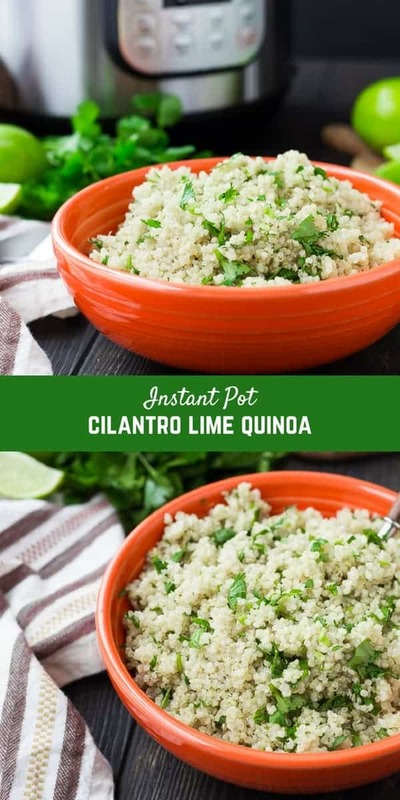 I love quinoa, but I never thought to make it in an Instant Pot. What a great idea! I need to try this lime cilantro flavor with tacos. Oh you will love using your IP for quinoa! I’m going to make another batch today! I love IP quinoa! So fast and perfect every time! I need to add lime next time. Sounds delicious! With two kids now in college, we’re down to three, I keep wondering if I really need an instant pot now. But, your recipes always look so good.